25 a long, clean stick - At the end of the week, if it has done hissing, you may put in a bottle & half of Brandy and one ounce of Isinglass, & then stop it close up - The Isinglass should be tied to a string, & nailed to the top of the cask inside - The wine may be bottled at the end of three months, if fine - or it may be drunk from the cask - Ginger Wine - Miss Clapham. To a gallon of Water put 2 lbs. 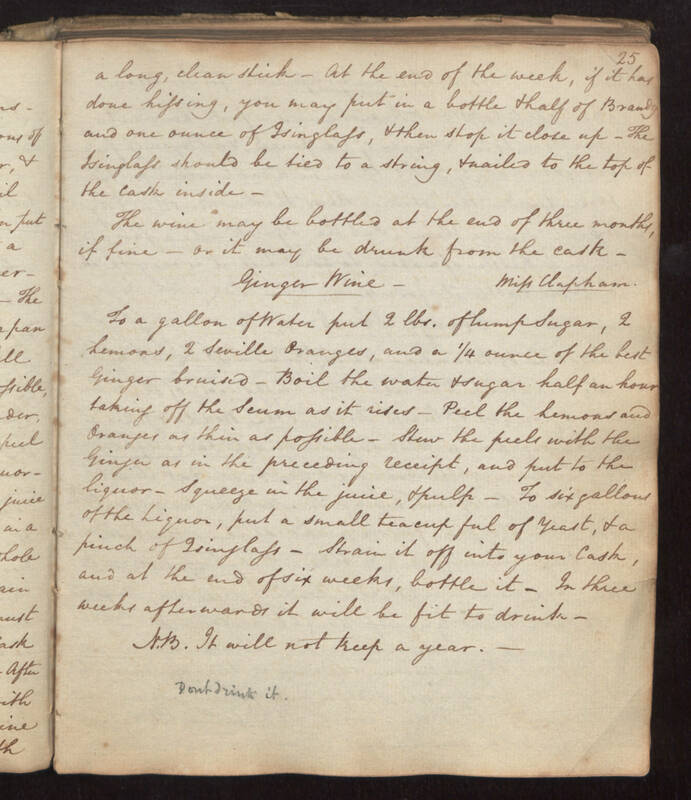 of lump Sugar, 2 lemons, 2 Seville Oranges, and a 1/4 ounce of the best Ginger bruised - Boil the water & sugar half an hour taking off the Scum as it rises - Peel the lemons and Oranges as thin as possible - Stew the peels with the Ginger as in the preceding receipt, and put to the liquor - Squeeze in the juice, & pulp - To six gallons of the Liquor, put a small teacup ful of Yeast, & a pinch of Isinglass - Strain it off into your Cask, and at the end of six weeks, bottle it - In three weeks afterwards it will be fit to drink - N.B. It will not keep a year. Dont drink it.